ATB Sports Solutions design, manufacture and supply our very own equestrian surface maintenance machine. The ATB Arena King has been specifically engineered to be robust, user friendly and can be used on a multitude of different surface types. Woodchip, sand & rubber, sand & fibre and wax coated surfaces can all benefit from regular maintenance with the ATB Arena King. All machines have split crumbler rollers to create a ‘diff’ action to make turning tight corners easier, putting less strain on the machine. Machines can be tailor made to be used behind tractors or ATV/4x4 vehicles. Swivel headstock- allows tractor mounted machines to follow the tractor around corners without dragging or excessive movement of the surface. Locks into position when in transport mode. 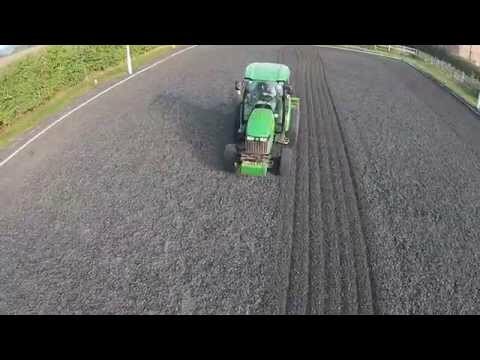 Edging board- this spring loaded plate is used to remove excessive surface build up from around the arena boards and deposits surface back into the path of the Surface Grader to be leveled. Please get in contact for further details.